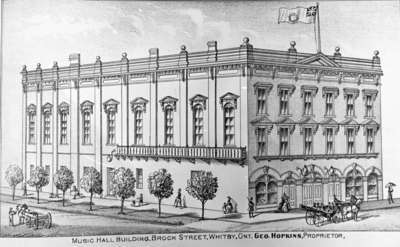 A black and white print of the Hopkins' Music Hall located at 201 Brock Street South. This print is made from a copy negative of a print in the Historical Atlas of the county of Ontario, published by J.H. Beers & Co. Whitby Public Library has a copy of this book available for your perusal within the library. Hopkins' Music Hall, 1877, J.H. Beers & Co. Whitby Archives 03-000-001.